"KY-2" redirects here. For the state route, see Kentucky Route 2. Kentucky's 2nd congressional district - since January 3, 2013. 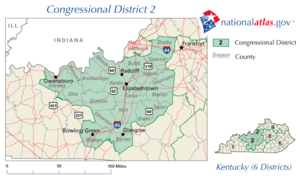 Kentucky's 2nd congressional district is a congressional district in the U.S. state of Kentucky. Located in west central Kentucky, the district includes Bowling Green, Owensboro, and Elizabethtown. The district has not seen an incumbent defeated since 1884. The district is currently represented by Republican Brett Guthrie. Former Representative Democrat William Natcher is noted for holding the record for most consecutive roll call votes in the history of Congress - more than 18,000 votes. The district is similar in character to the 1st district. While Democrats still hold most local offices in the district, they tend to be very conservative on social issues, a trend that leads them to vote Republican in most national elections. As of June 2016, there were 532,145 registered voters: 267,853 (50.33%) Democrats, 222,631 (41.84%) Republicans, and 29,501 (5.54%) "Others". All of the "Others" included 11,071 (2.08%) Independents, 843 (0.16%) Libertarians, 146 (0.02%) Greens, 65 (0.01%) Constitutionalists, 16 (0.003%) Reforms, and 19 (0.003%) Socialists. 5th Elected September 7, 1792. March 3, 1813 12th Elected in 1808. January 19, 1814 13th Redistricted from the 5th district and re-elected in 1812. March 3, 1815 Elected to finish Clay's term. October 30, 1815 14th Henry Clay was re-elected in 1814, but the Governor declared the seat vacant as Clay was out of the country. 16th Elected to finish his vacant term. 20th Redistricted from the 4th district and re-elected in 1822. 24th Redistricted from the 11th district. March 3, 1845 28th Redistricted from the 6th district. Resigned to enter the Union Army. Resigned when appointed to the U.S. Customs Court. December 5, 1936 74th Redistricted from the at-large district. As of June 2017[update], there is one living former member from the district. The most recent representative to die was William Huston Natcher (served 1953–1994) on March 29, 1994. ^ "Voter Stats" (PDF). Archived from the original (PDF) on 2016-03-29.